Hoseasons have been providing boating holidays on the Norfolk Broads since 1944, so you can be sure they know a thing or two about boating holidays. You have a variety of locations to start your cruiser holiday from - Brundall, Acle and Wroxham and Hickling; all have a boat yard for you to start your boating holiday. The Norfolk Broads offer beautiful scenery in which to take a relaxing boating holiday. You have miles of connecting rivers, broads and marshes with which to explore. 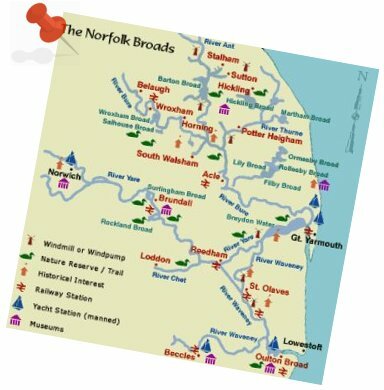 Unlike the canal network, there are no locks on the Norfolk Broads, and this may appeal to all you first time boaters out there. The cruising speed is no more than 4mph, so you don't have to worry about any high speed collisions! In fact, you don't even need any kind of driving license for your boat holiday, so there really is nothing stopping you. The boat-yard where you pick up your boat will show you everything you need to know about your holiday boat - how to steer, what to check, that sort of thing. Any novices out there who are thinking of having a go can rest assured you will be given all the knowledge you need before you're let loose on your own with your boat. You'll have plenty of opportunity to moor-up, and explore the area. The rivers on the Norfolk Broads cut through the centre of many market towns and villages, and there are plenty of pubs and restaurants on the banks on the rivers to take your breaks. I like the sound of the Norfolk Broads - show me some boats! For a list of boats available on the Norfolk Broads, have a look at www.boating-holidays-uk.co.uk. To book your next boating holiday, have a look at Hoseasons. Where ever you decide to start your Norfolk Broads boating holiday, I hope you have a calm and relaxing time.